Like lots of kids, Superman is faster than a speeding bullet and can’t be stopped. Like teenagers, he thinks he’s invincible and has a snazzy wardrobe. And, like children with food allergy and other causes of anaphylaxis, he can be hurt and weakened by even small amounts of a substance that is harmless to most. For Superman, it’s Kryptonite, for kids with a food allergy, it’s their allergen. Superman and kryptonite are make believe and make for an awesome story. But, food allergy is very real and must be taken seriously. Kryptonite is make believe, but how can a food allergy do that? Let’s start with some basics. A food allergy is an abnormal immune response to a food – in most cases a food protein. Our immune system is what we use to fight germs like viruses and bacteria. Sometimes a person’s immune system gets confused and attacks a food. This can cause an allergic reaction and can be severe. Superman always has a plan. What is the plan for food allergy management? Know the pillars of food allergy management. People with food allergy need to prevent allergic reactions and be prepared for allergic emergencies. They need to do certain things to say safe. 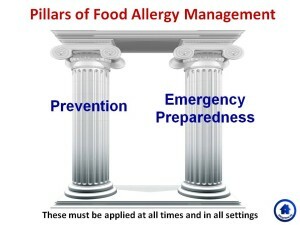 Prevention and preparedness are the two pillars of food allergy management. You need both, always. Superman is always ready. When is food allergy management needed? Good food allergy management has to happen at all times and in all circumstances. Any responsible person (babysitter, teacher, grandma, the child themselves when old enough, etc.) must be trained and ready. Keep in mind changes in routine, and transitions in care givers can make for breakdowns in management. Ever hear of the Justice League? Superman doesn’t do it alone. Kids without food allergy can help support kids with food allergy. They can help make sure that they take good care of themselves and encourage them to stay safe. As other kids become more aware and understanding they can become allies and help discourage bullying and teasing. Kids are the real superheroes! Kids with a food allergy have a big responsibility; to take good care of themselves and be kids. It is an always, everyday thing, and they keep doing what they do. Always remember that they are who they are and they happen to have a food allergy. Our children each have their own “Super Powers;” dancing, swimming, computer programing, playing Legos, reading, you name it. Let’s remind them how great they are. They are the real superheroes. What is your child’s “Super Power”? Please share with us in comments below.